From the rumors that there really isn’t any gold in Fort Knox, to the mystery of D.B. Cooper, all the way up to — dare we say it? 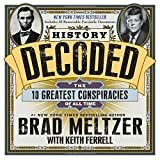 — the Kennedy assassination, Meltzer puts fresh eyes to old theories and comes up with answers that are often startling. In the history olf our nation there have been more than two dozen assassination attempts on the President of the United States. Four have been successful. But now, Beecher White — the hero of Brad Meltzer‘s thriller “The Inner Circle” discovers a killer in Washington, D.C., who’s meticulously recreating the crimes of these four assassins. Folks of a certain generation talked about where they were when Franklin Roosevelt died. Today we all remember where we were on 9/11. For millions, the bad memory of a lifetime was where they were when John F. Kennedy was assassinated in Dallas, Texas on November 22, 1963. Gerald Blaine remembers exactly where he was. Blaine was a member of the Secret Service team traveling with and protecting President Kennedy and First Lady Jacqueline Kennedy. For 47 years he kept his silence about the tragedy. Until now. With the help of other surviving Secret Service agents — including Clint Hill, the agent best remembered for helping get Jackie Kennedy back into her seat, as she scrambled out onto the trunk of the presidential limousine — Blaine has written a compelling, firsthand account of everything that transpired that day, and the days that followed.